The problem with having a boat as a home is that you tend to keep all sorts of things on board that will be needed one day but aren’t required for the present. Our next big adventure is the Tour des Ports de Manche regatta starting on Sunday from St Vaast La Hogue on the east coast of the Cherbourg Peninsula (La Contentin). For this event we don’t require a library of books, several hundred DVDs & CD (the iPod will suffice), duvets, bedlinen & spare bath towels, a storage box containing reels of electric cable or the spare battens that don’t even fit the mainsail we’ll be using and much more. Some of the stuff has to go simply to make room for our crew! 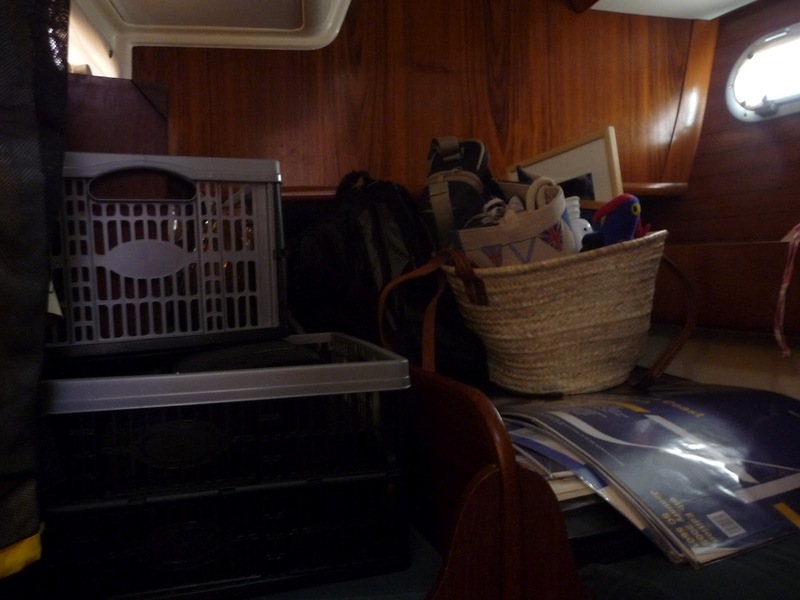 With storage ashore kindly provided by our home marina slowly we are emptying cupboards and shelves as well as the port aft cabin, which in live-aboard mode is used for stowage but will be required for crew accommodation from Thursday. It is proving to be a great opportunity to clean places seldom reached! Meanwhile the boat is a mess with piles of things everywhere until it goes ashore. 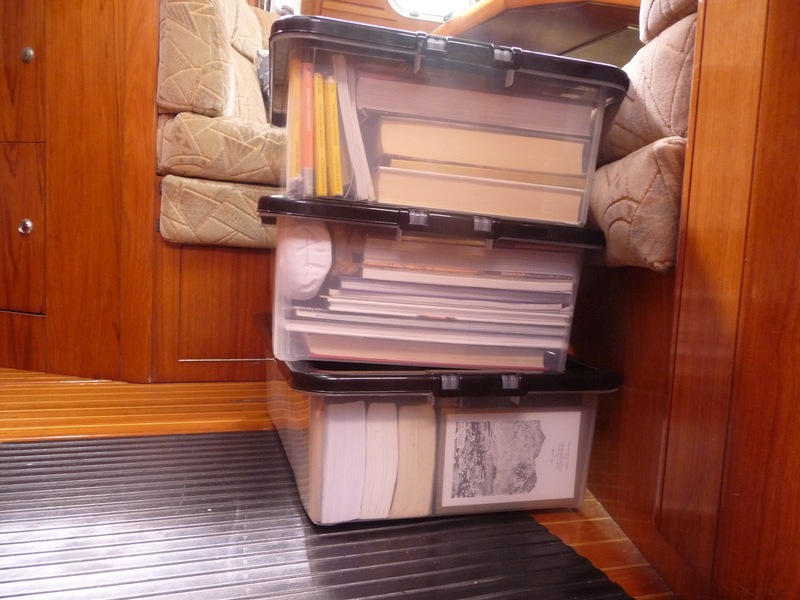 However during this unexpected spring clean we have even gone through those boxes of spares that every boat carries – plumbing bits, light bulbs and deck gear – throwing away rusting objects whose original purpose is a mystery to both skipper and first mate and reinstating some order to each box in case the contents are needed in a hurry. It is amazing that so much could have been stowed on one boat! And each time we think that has to be it, another little something occurs to us. What about the diving tank and allied kit stowed under one of the aft bunks? Or the extremely heavy set of boule tucked away in the bottom of a locker full of fleeces & jackets? Come to think of it do we need an entire winter’s worth of jackets, jumpers & fleeces for a week’s summer racing? Or will the small overall weight loss be outweighed by the hassle of finding yet another receptacle to store them in? Just how much stuff is it actually worth removing given that she is not exactly a lean mean racing machine by design? On deck, the outboard and the main anchor with its more than 75m of chain are earmarked for leaving behind. The anchor and chain are already resting in the marina mud and the bow sits a full inch higher. Our lighter, secondary gear of 30 m of chain attached to lots of warp has been retrieved from the bottom of the anchor well and the smaller CQR attached – it won’t hold us in a big blow but will kedge us if the tide proves unfavourable for progress on the race course. 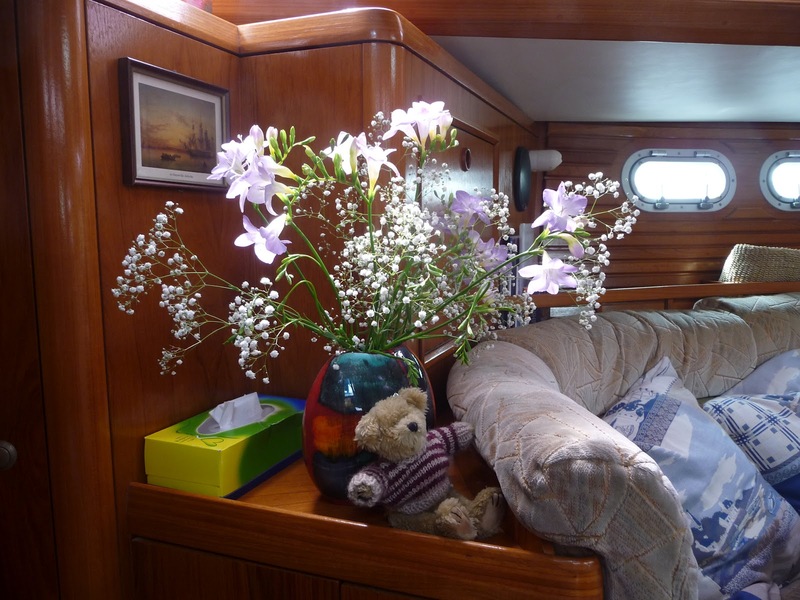 A bird book and the flower vase are staying – a matter of principle for the former (a tale for another day from our 2005 Fastnet Campaign) and of standards to keep up in the case of the latter! From the galley cupboards weighing scales, mixer, travel iron & toaster are going ashore but would an electric kettle be useful in port with so many on board? As we’ve run out of boxes for books the collection of pilots for exotic parts will most likely have to stay but the chart folios will not. Then all the sails need to come out of the forward lazerette so the bikes stowed under them can go ashore while the spinnakers need switching to racing mode too by removing them from their snufflers and repacking into bags more suited for rapid deployment. By Saturday afternoon five crew and their kit will be on board ready for Sunday’s first race to Cherbourg so it’s only a very temporary weight loss! Then in a couple of weeks we’ll be trying to stow it all again prior to our summer cruise but at least the cabins & lockers will be cleaner.